The backbone of any E-commerce store is sales, an optimum sales will drive your store steering in real direction. To achieve the same many strings at backstage are to be pulled in terms of efforts. If you have an only online store or brick mortar + online, in both cases high conversion rate is an antidote for any of the product category you sale. First of all, observe, are your effort strings helping you to pull your sale up? If graph report comes with all red and green lines declining then surely some or excess mending is required to acquire high E-commerce conversion rate. Make your website lucid: Be it small or large scale store size doesn’t matter. Simple accessibility is the key. Your online store might be stocked up with countless product categories & subcategories but stuffing all your products into one page is an inept approach. Instead of derangement, the most efficient way is to pin top notch products on a page that has elevating profit margins. Always prefer to have proper and simple navigations (simple bifurcation of categories & subcategories) such approach will help shoppers to easily purchase products. Optimum quality images: Most important element in an online store is an image, brick and mortar gives shopper tangible way and accordingly people buy but on an online platform, your image is the only medium that will speak out loud. Images captured from varied angles and especially image comprising of clear features of the product will help shoppers to make a proper decision to purchase a product. Small size, blur images, product features not accurately visible etc will surely encourage the customer to click cross/close button on the site. Precise product description: Product description page is a vital part of any online store as from this page only shoppers will get to know each and every detail regarding the product. Elements like product title, product description, product image, sizes, color, price, availability, terms & conditions, discounts or offers etc all these make a product page. It is advisable to have to the point details on this page; accurate details will give buyer crystal clear views regarding the products. Media Demonstrations: If the customer arrives at your physical store you will surely be able to explain the workings of the product at that very moment by giving them a demo. Same is the case with online store; provide demo provisions on your site. Include relevant product working media’s like videos, infographics etc such media will give an exact idea regarding product working. Products that require assembling or mending if explained through videos then buyers will get to know how to use the same after their purchase. 24*7 Customer service: Your physical stores can have sales personnel’s, helpdesk, or informative booths, but in an E-commerce store customer services options are toll-free phone numbers, email, live chat. Customer according to his/her preference can choose relevant option to get all queries answered. These services should provide instant help, for example, if any shopper is facing an issue on checkout page then his/her query should be resolved that very moment or else you will lose a customer. 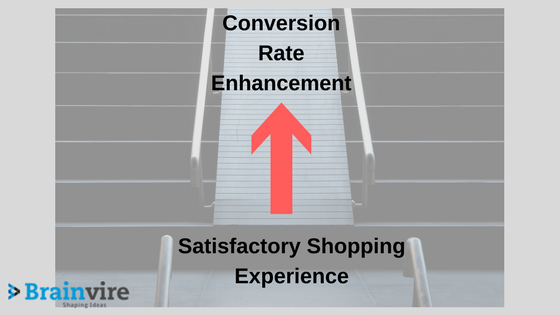 Above all point’s implementation’s result will directly affect E-commerce conversion rate. To survive in a competitive market it is necessary to work on e-commerce conversion enhancement because the only way to increase the sale is how efficiently your products and services are made available to customers and are they able to purchase products seamlessly using them. Each and every shopper is important, their product reviews, purchases, their frequent visits etc all such aspects will boost your E-commerce store conversion rates.